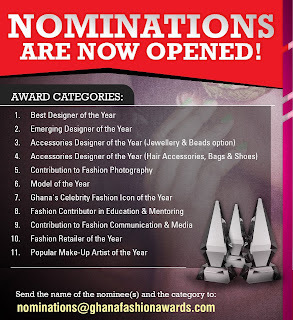 Fashion Xpo, organizers of Ghana’s premier fashion awards scheme, have officially announced the opening of nominations for the GHANA FASHION AWARDS (GHFA) 2012. The awards, in its second year, after a hugely successful debut last year, is aimed at celebrating the excellence in Ghanaian fashion whiles rewarding and promoting achieving Ghanaian Designers & Industry players of the Year under review. It has also managed to disseminate knowledge and information on Ghanaian fashion and its contribution to Ghanaian society and culture as well as heighten the confidence and awareness of the Ghana fashion industry; designers, educators, operators, services and fashion related businesses. Following the success of last year, the Ghana Fashion Awards 2012 has undergone many exciting changes resulting in the addition of 5 new categories to existing ones from last year; thus increasing the number of categories to eleven from six last year. The categories open for nominations from last year include; Best designer of the year, Emerging designer of the year, Accessories Designer of the Year (Jewellery & Beads option), Contribution to fashion Photography, Model of the year, and Fashion Retailer of the year. Key amongst the new categories for this year is sure to be the award for Celebrity Fashion Icon the year is would be seeking to award the most fashionable and trendsetting celebrity of the year. The other new categories include; Popular Make-up Artist of the Year, Contribution to Fashion communication & Media, Fashion contributor in Education & Mentoring, Ghana's Celebrity Fashion Icon of the year, Accessories Designer of the Year (Hair accessories, bags & shoes). Winners from last year included, Designer of the Year – Christie Brown, as well as Inka Accessories winning the Designer of the Year - (Accessories) amongst many others. 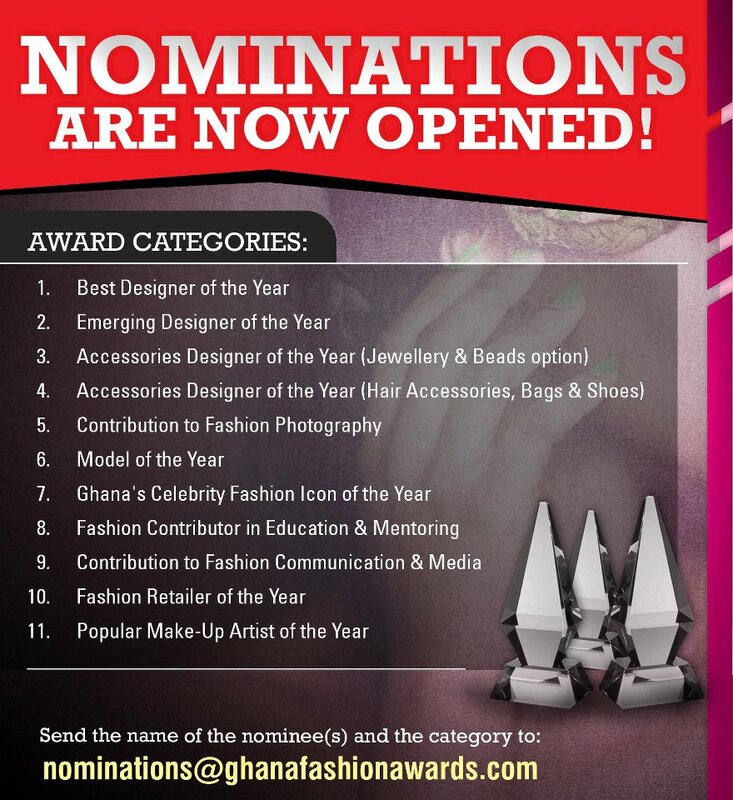 Nominations are opened till 10th September, 2012 and nominees must be Ghanaian leaving in Ghana or abroad and should have contributed significantly to the development of fashion in Ghana. This year's grand awards night is set for November.